I hope you all enjoyed your day of love yesterday! For my heart and I, we celebrate on the 17th- Our Valentines Day. This is in honor of the first one we spent together 12 years ago, when he was flying over February 14th and we celebrated on the 17th. That was the day he asked me to marry him. I love our story because to me this was the start of our promise to be together forever and as such even a bit more special than our wedding day which sealed the deal. Surrounded by 144 roses that he placed in the Victorian turned restaurant over looking Puget Sound, he asked proposed and every year since we renew that commitment. If you are wondering why we are wearing jeans at a nice restaurant, I had spent the day teaching pre school and he didn’t want me to know we were doing anything special so he picked me up dressed the same way so I wouldn’t guess what he had planned-sweet huh? It’s key to being successful at anything, whether marriage, or even creative pursuits, to renew your commitments every so often. It helps reaffirm the direction we are heading and to make sure we stay on the course we want or even to make adjustments and head in a new direction. I love that you said the wedding just seals the deal and the moment of agreement is most special. Those few seconds in time between the asking and answering are etched into my memory far more than the “I do” moment. I enjoyed your interview with Leslie Riley. Love your love story too. My husband and I like to celebrate the first date we had. I think it is important to always have those little touchstones of memory to go to as reminders of why we fall in love with the ones we love. 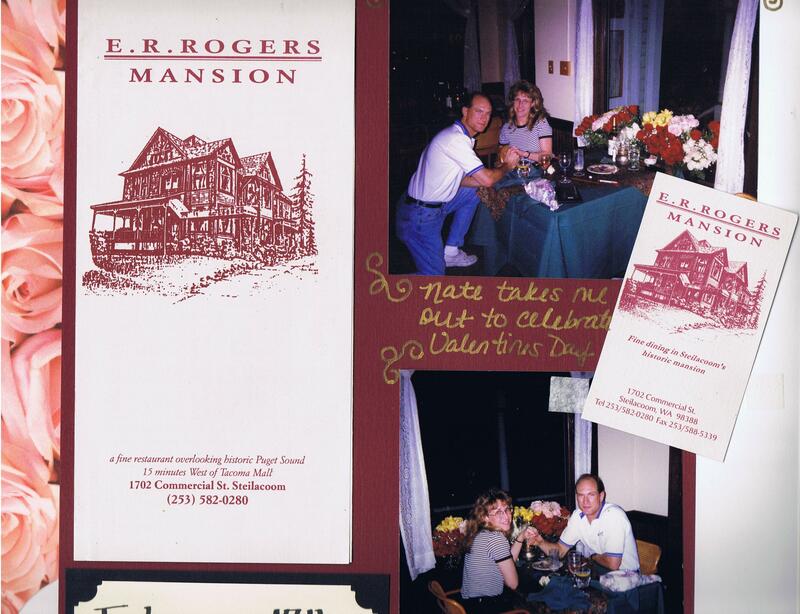 ER Rogers was one of our favorite spots for years and miss it terribly. Many a romantic dinner and special spot for friends and family. Nice choice for a proposal! Congratulations Pam. What a sweet love story. You guys are an inspiration. congratulations on a wonderful valentines love renewal. how sweet! i listened to your on air broadcast last night! Thanks for sharing your love story!